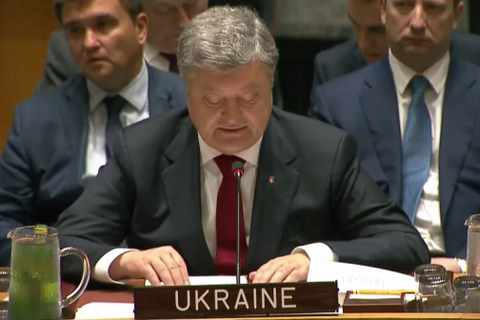 President Petro Poroshenko has called on the UN Security Council to deploy peacekeepers to Ukraine "the sooner the better. "Ukrainian blue helmets have participated in peacekeeping operations throughout the world. But, today we need the UN's peacekeeping shoulder too," he said in his speech. He recalled that Russia's three-year-long aggression has cost Ukraine over 10,000 people killed, about 25,000 wounded and about 1.8 million internally displaced. "If a tragedy of this scale does not require a peacekeeping mission, which one does?" he exclaimed. "Let me confirm my request to the secretary-general to exercise his power in accordance with the charter and send a technical assessment mission to Ukraine," he added. Its findings can be used to consider possible options for UN peacekeepers' presence in Donbas. "A road to effective peacekeeping – and, eventually, to a settlement – lies through unconditional withdrawal of all foreign military personnel, mercenaries, their weapons and equipment from Ukraine. Moreover, reliable international control over the temporarily uncontrolled part of the Ukrainian-Russian border should be secured," he said. He added: "We remain convinced that a full-fledged UN peacekeeping operation is the only viable solution to de-escalate, to protect people of Ukraine and to get us closer to a political solution. That is why the peacekeepers' mandate should cover the entire occupied area, including the Ukrainian-Russian state border. This is a must."